Tradition plays an integral role here in Lesvos, and local customs and celebrations are events in which the whole island population revels. 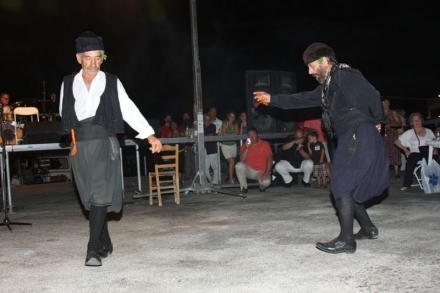 Here is a list of the major traditions and celebrations observed in the island - happen to witness one of them and you will gain an important insight into the culture of this amazing north Aegean location! 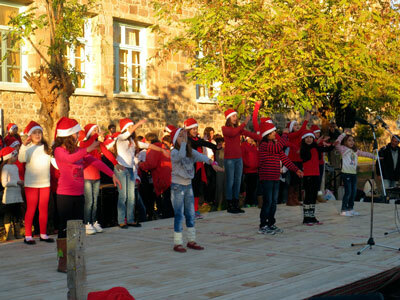 Lesvos locals celebrate Christmas in the manner of millions of Greeks who, in the course of the holiday season, prepare and consume traditional celebratory cookies (‘melomakarona’ and ‘kourabiedes’) and follow the European custom of decorating a tree or, more traditionally, a boat. In some areas, an olive branch is decorated instead. This custom is still being observed in Plomari, where an olive branch is hung over the family threshold in order to ensure a plentiful harvest. The members of a traditional Lesvos family will observe the custom of crushing a pomegranate on their threshold moments after midnight to celebrate the New Year and ensure prosperity. The custom of the ‘unspoken water’ is still being observed in many Lesvos households: one of the family brings holy water from the local church, making the trip from and to their home in complete silence in order to grant the family providence in the coming year. The Greek ‘vasilopita’ is a cake that is traditionally consumed on New Year’s Day and always includes a coin - find it and be the lucky family member for the entire year! Arrive at Lesvos at Easter and have a taste of ‘tsoureki’ (sweet Easter bread) and marvel at the ingenuity with which a hard-boiled egg can become an object of beauty. Almost all Greek households dye their eggs red in anticipation of Easter Sunday and the results of the custom may at times be simply ingenious. Good Friday is a day for honouring the dead and locals flock to the local cemetery in order to honor their deceased family members, adorning gravestones with flowers and scenting the air with incense. Each church is adorned with a flower-decorated bier, which is paraded around the village or neighborhood in the evening, in a somber candlelit procession. On Holy Saturday night, during the Easter Resurrection service, the priest’s announcement that the Christ has risen is celebrated with a pandemonium of fireworks. When believers return home, they sit down to share a meal of traditional Easter dishes such as ‘magiritsa’ (usually, a soup of lettuce leaves and lamb inards). On Easter Sunday, spit-roasted lamb and ‘kokoretsi’ are customarily on the menu. 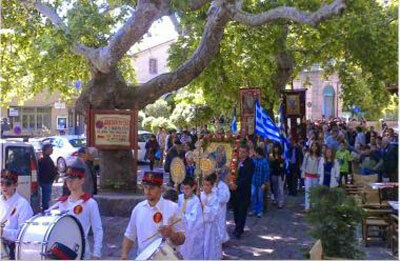 Witness a traditional wedding ceremony in Lesvos and be treated with rose-scented marzipan and baklava. Traditionally, the female relatives of a bride will help her dress while singing traditional wedding songs, which continue on after the wedding ceremony, in a celebratory feast with music and traditional dancing. In some Lesvos villages, the wedding custom of a troupe of musicians stopping at the house of every wedding invitee and collecting them along with the bride and groom is still observed. An occasion for much celebration, a traditional wedding continues to be a jovial event that is hugely worth witnessing. Visit Sigri on July 24 and witness the custom of ‘Klidonas’, in the course of which the locals light fires in the streets and jump over the hot ashes. Over the last Saturday and Sunday of June (or the first July weekend) Agia Paraskevi becomes inundated with visitors who flock here to attend the festival of the bull (also taking place in the smaller village of Pigi a week after). A perpetuation of the ancient custom of animal sacrifice, the festival of the bull involves the slaughter of a flower-adorned ox and includes horse races and the preparation and consumption of ‘kiskets’ (a meal of the ox’s meat and cereal) which is traditionally shared out to the pilgrims. A fortnight after Easter Sunday, the feast of the Taxiarches in Mandamados is a glorious celebration of the holy Archangels Michael and Gabriel. 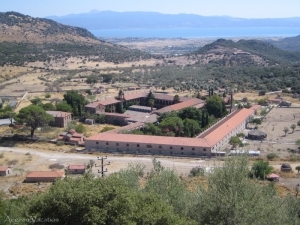 One of the major religious celebrations of Lesvos, the feast of the Taxiarches is an occasion when hundreds of pilgrims flock to the village of Mandamados, visit its church of the Holy Archangels, and participate in a festival of much music, singing and dancing. Arrive at the Monastery of Limonos on October 14 and take part in a celebration of Saint Ignatius. On the eve of Saint Ignatius’ feast, the night service at Limonos revives the entire Byzantine religious rite. Perhaps the largest religious festival on Lesvos island, the feast of the Virgin Mary on August 15 is celebrated in Petra and, on an even grander level Agiasos, the village many consider the Jerusalem of Lesvos. The International Women’s Festival in Skala Eressos.